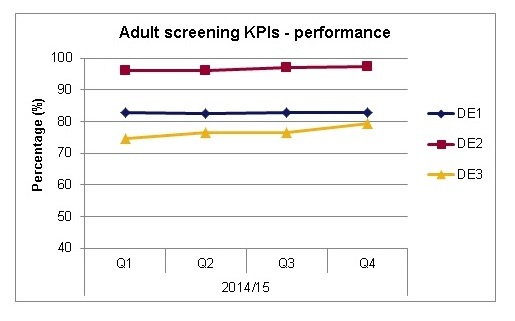 Key performance indicators (KPIs) are used to measure how the NHS screening programmes are performing. We have previously blogged about what the KPIs are and how important it is to get good quality data. 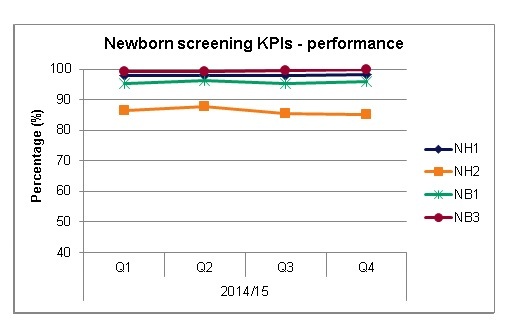 In these reports we currently publish data on 17 KPIs across the screening programmes; 6 for antenatal, 7 for newborn and 4 for adult. See table 2 below for the full list, we are looking into including additional KPIs to cover all of the screening programmes. The national averages show that the acceptable thresholds were met for 10 KPIs and achievable thresholds were met for 4 KPIs (table 1). 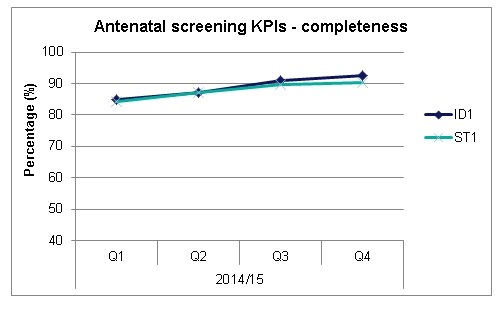 Completeness of data (where providers submitted data for all 4 quarters) for the antenatal and newborn screening programmes has improved since 2013/14 but remains an issue. Across the antenatal programmes completeness ranged from 80% (ST1: sickle cell and thalassaemia coverage) to 99% (ID2: timely referral of hepatitis B positive women) over 2014/15. However completeness across the 4 quarters in the year improved for ST1 and ID1 (antenatal screening coverage for HIV), see figure 1. Of providers who did submit data, the screening indicators for coverage remain high nationally; antenatal HIV (ID1) and sickle cell and thalassemia (ST1) both at 98.9%, newborn hearing (NH1) at 98.0% and newborn blood spot (NB1) at 95.8%. 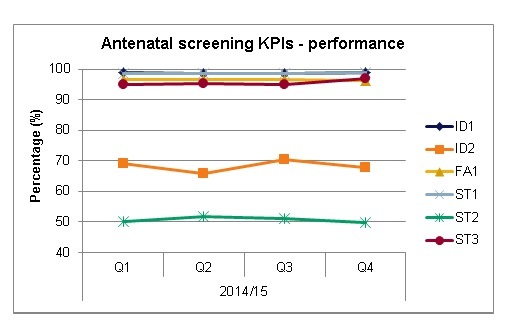 See figure 2 for antenatal screening KPIs, figure 3 for newborn screening KPIs and figure 4 for adult screening KPIs. DE3 (timely assessment for R3A screen positives for diabetic eye screening) reached the acceptable threshold of 80% for the first time in Q1 2015/16 and has maintained this in Q2 2015/16, however this is also a small number KPI therefore performance should be interpreted with caution. There were 99 KPI submissions for NP1 (coverage of newborn and infant physical examination), which is an improvement on 74 in Q1. Except for NP1 and NP2 (which we do not recommend to use as a performance measures due to low completeness) and AA1 (which is a cumulative annual indicator), the difference between Q2 and Q1 national averages for all KPIs was less than 1 percent.